The Annual Awards Gala is steeped in rich tradition and history of over 100 years. The awards we present are given with input from our members to our members. 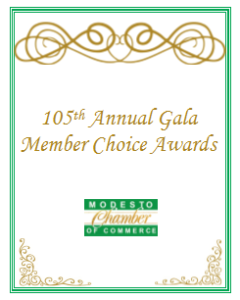 The evening will also recognize outstanding businesses and individuals who are a positive influence in the greater Modesto area through our Member Choice Awards. We have set the stage for you to take a culinary tour of the best of the best Modesto has to offer while you sip fine beverages. The evening features top shelf entertainment, a live band, video presentations and much more. This black-tie optional event is a night to be remember and the talk of the town for months to come.